We finally moved in! We got a sign! So we've been in the building for well over five years now, I've been with Engage 5yrs coming up in May. While we did move downstairs, from upstairs (obviously), in that time, we have never had a sign on the building with our name. 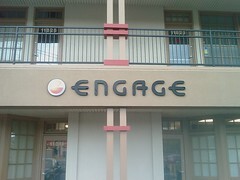 Well today that changed, check out the new Engage signage out front, I must say, I think it looks great! But now, instead of people calling the landlord to see if the office space is available, they may call and ask "What's engage?"